Cranes tower over Denver, literally and figuratively, as an illustration of the building boom. The crane is Colorado’s new state bird. I first wrote that line, or something like it, for the Rocky Mountain News in the mid-1980s. At that time, developers from Canada, Texas and other places, were changing the skyline of Denver. Cranes are towering over Denver. Photo courtesy of GE Johnson. During that era, Republic Plaza and Tabor Center were under construction in downtown Denver and the Denver Tech Center was poised to double in size. While new office buildings were driving the building boom in the go-go days of the ‘80s, while in recent years it has been largely multifamily projects that are putting the cranes to work. 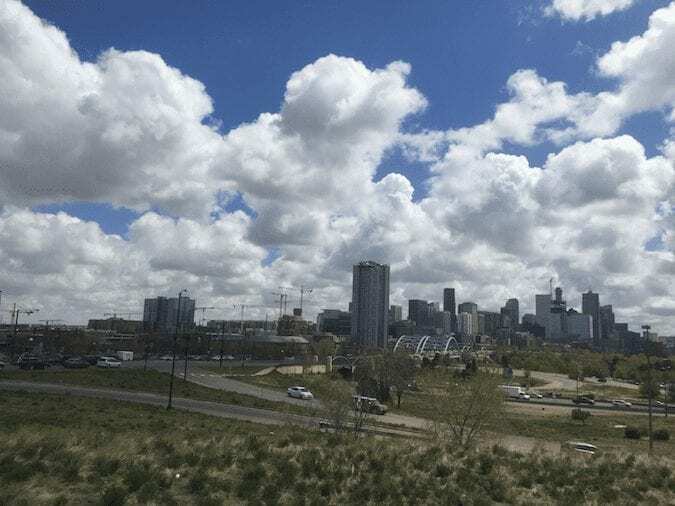 Earlier this year, a national report ranked Denver No. 2 in the nation for the number of multifamily cranes in service. 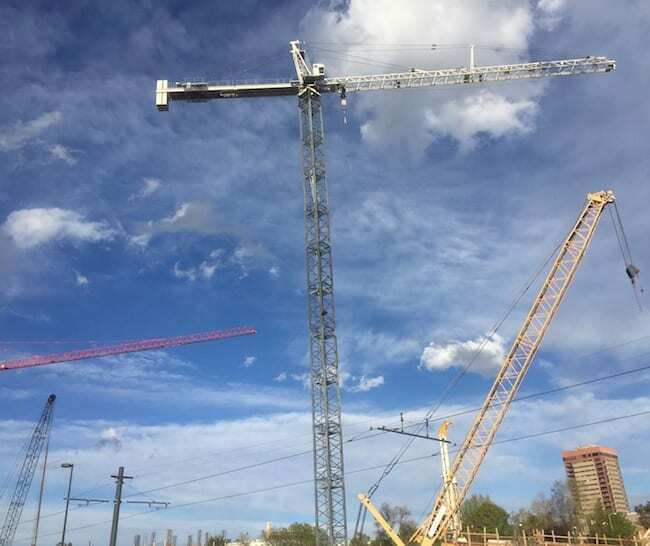 The Crane Index released by Rider Levitt Bucknall North America, a Phoenix-based construction consulting firm, said last November that 10 of the 19 cranes in Denver were for multifamily projects. Only Chicago, where 31 of its 56 cranes were for residential projects, topped Denver by that metric. 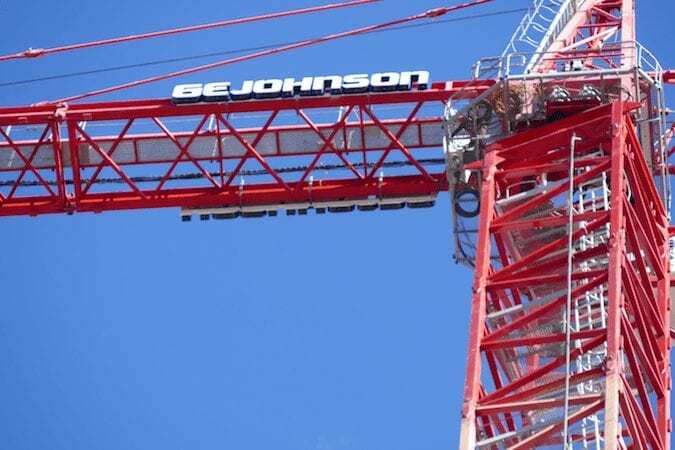 Trey Nobles, Sr., a vice president of the Rocky Mountain region for GE Johnson Construction Co., thinks RLB is under-counting the number of cranes looming in the Denver area. “Maybe in Denver proper there are 19 cranes, but if you look at the surrounding area like Greenwood Village and Lakewood, there have to be more than 19 of them,” Nobles said. In fact, the DenverInfill Tower Crane Census in late 2016 counted 32 tower cranes in central Denver alone, and that number has stayed steady since then. Indeed, while driving home on California Street from a function last Saturday night, he counted five cranes from one spot near the Colorado Convention Center. “To be able to see five cranes from one place is pretty incredible,” he said. Cranes are going crazy in Denver. 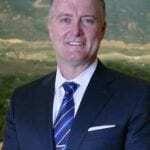 And GE Johnson alone has eight cranes currently operating in the Denver area. It just took a couple of them down, in fact. Most buildings of five to six stories or taller typically need a crane, he said. A three-story apartment building, for example, might be able to be built using forklifts or pulley systems, and not cranes. “Cranes are the most efficient way of moving materials around and stairs are the least efficient method,” he noted. 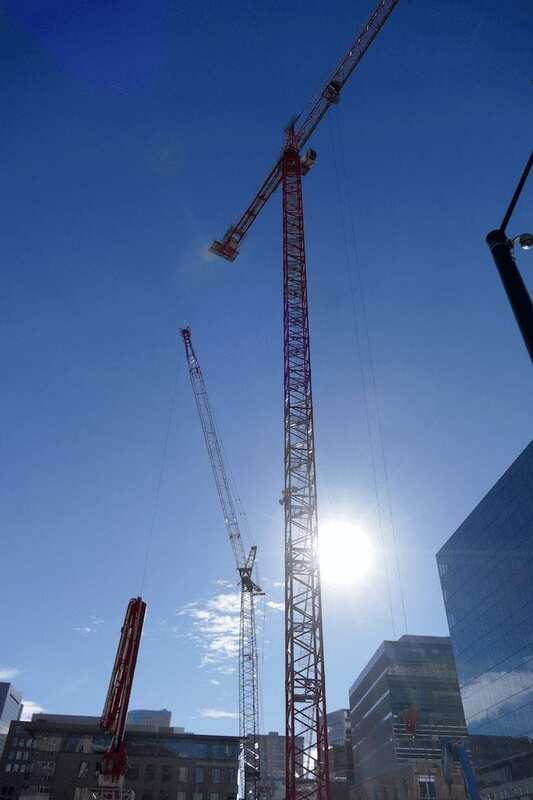 Most of the cranes in the Denver area are known as jumper cranes, which are designed to rise as the building goes up. Some sites need two cranes. So if you drew a 50-foot radius around a crane, it might be able to lift 5,000 pounds. Go out another 50 feet and you might be able to lift only 1,000 pounds. And it’s no simple task to move the big, tower cranes, as they are typically built on large structures anchored by caissons to transfer the the load to the ground, he said. “There are some cranes made to travel on rails, but you do not see those very often in Denver,” Nobles said. At GE Johnson, there has been no shortage of cranes in the Denver area. 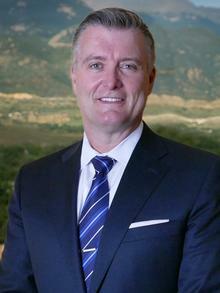 GE Johnson has not suffered from a shortage of cranes in the Denver area. Photo credit: GE Johnson. “We made very early arrangements for the cranes,” some of which are owned and others are leased, he said. 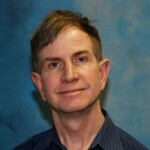 He does think it is likely there is a shortages of cranes in some markets, which could slow the construction process. In the ‘80s, Nobles was in Denver, but as he was still in high school, he wasn’t quite the aficionado of cranes as he is today. Cranes soar in downtown’s skyline. So does he think cranes are Colorado’s new state bird?